Many who describe themselves as vegetarian also report eating meat. Non-vegetarians often have “meatless” days. How do these groups compare to “true” vegetarians? Who Says They Are Vegetarian? 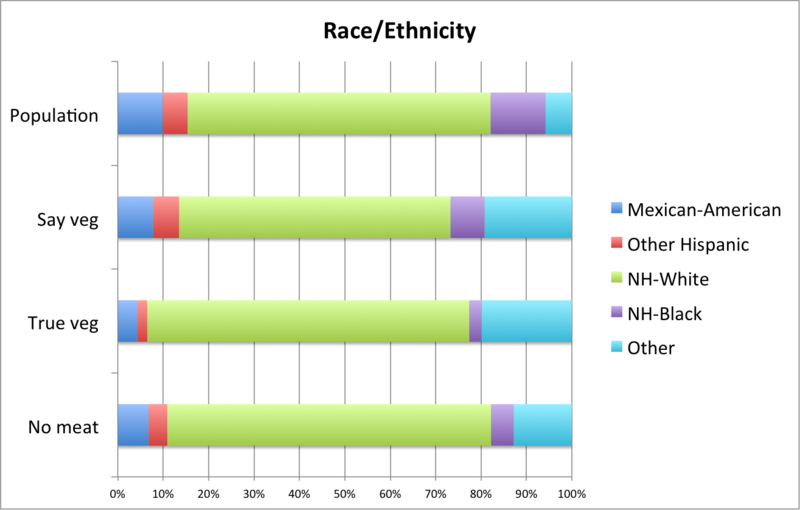 My previous blog post reported on the demographics of self-reported vegetarians using a dataset from the National Health and Nutrition Examination Survey (NHANES). NHANES is sponsored by the Centers for Disease Control and Prevention (CDC) and collects data on a nationally representative sample of the civilian, non-incarcerated US population. Approximately 2.2% of the non-incarcerated, civilian U.S. population self-describe as vegetarian when asked. Self-described vegetarians are more likely to be female, college-educated, born in a non-Spanish speaking country outside the U.S., and to identify as a race/ethnicity other than White, Black, or Hispanic. But, not all those who say they are vegetarian eat a meat-free diet. Every year, NHANES participants are also asked to complete dietary recall surveys for two 24-hour periods. This involves them listing everything that they remember eating. Dietary recall surveys are thought to be among the most accurate ways to find out what people really eat (short of watching them all day!). When WenYen Juan and colleagues looked at the first 24-hour dietary recall they found that 48% of self-described vegetarians reported eating red meat, poultry, or fish. Why Do Some “Vegetarians” Eat Meat? Dietary interview data is thought to be one of the most reliable ways to measure food intake—recipients provide a record of what they actually eat. It shows that many self-described vegetarians actually report eating meat or fish. This prompts the question of what, if anything, is different about true vegetarians versus others who answer the vegetarianism question positively. Is it a misunderstanding or a language issue? Do people have different ideas of what it means to be vegetarian? Are many of the meat-eating vegetarians actually pescetarians? More significantly, does this data mean we should reconsider using the label “vegetarian”, and turn our focus instead to who eats little or no meat? I tried to make headway in answering these questions by comparing some different groups: self-described vegetarians who reported eating meat, self-described vegetarians who did not, and respondents who reported eating no meat independent of their “vegetarian” status. I looked at the demographics of all the NHANES participants between 2007-2010 who had complete dietary recall data (over 16,000 individuals). For most analyses, I excluded infants (under age one)—lots of them are vegetarian simply because they’re on the milk-only diet. This left about 15,500 individuals. More details on the methods and results can be found in the full report. First, I looked at what proportion of the population reported various diets. Although 2.1% of the population claim to be vegetarian, only 0.9% of the population bear that out when asked about their food consumption. This result is consistent with other studies that ask people whether they are “vegetarian” and ask what they ate. We should also expect that the number of true vegetarians is even lower than this, since respondents who reported no meat or fish on either of these two days might still have eaten meat or fish on some other day. When Saulius Šimčikas and Harry Burdon analyzed another question asking respondents if they had eaten finfish or shellfish in the last 30 days, their estimates of how many people ate a vegetarian diet were cut by about half again. I initially wondered whether many non-veg “vegetarians” were really pescetarians who called themselves vegetarian. The data suggest this is not the case. A tiny fraction of self-described vegetarians ate fish but not meat (23 out of 327). Moreover, among the whole sample—vegetarian and not—only 155 (1.3% of the population) reported eating fish but not meat. In the United States, the fish-only crowd is very small. On the other hand, many respondents reported not eating meat or fish. An estimated 12.2% of the population ate vegetarian at least one of the two days and 2.2% of the population ate vegetarian both days. Is It A Language Issue? There is a higher proportion of non-English speakers in the meat-eating “vegetarian” group than in the group who say they are vegetarian and the overall population. Of the 56 respondents who said they were vegetarian and completed the interview in Spanish, 53 later reported eating some meat or fish. But, this demographic only represents a quarter of the meat-eating “vegetarians,” so it’s clearly not just a translation issue. Are “Vegetarians” Actually Just “Reducers”? Another possibility is that self-described vegetarians who eat meat still eat less meat than others. 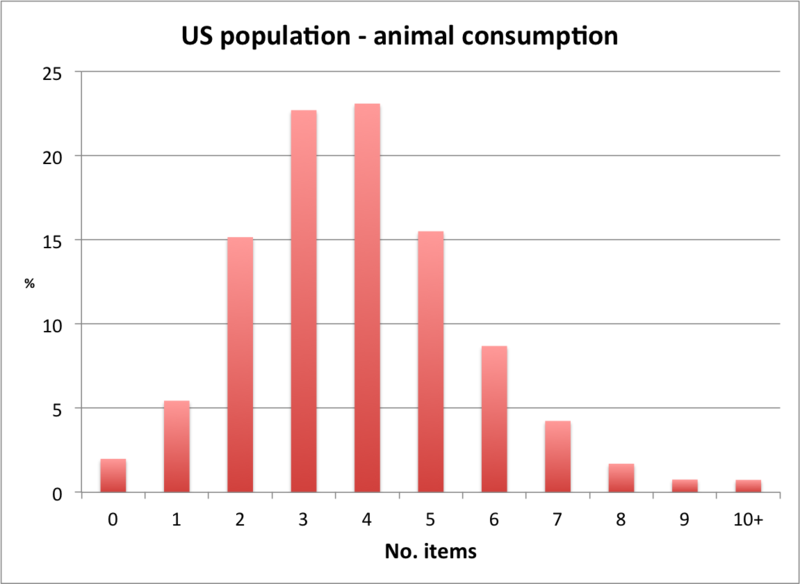 I tested this hypothesis by comparing the number of meat or fish items recalled over the two days combined. Having previously described the demographics of self-described vegetarians, I wanted to compare them to some other dietary groups. I calculated population estimates for gender, race/ethnicity, country of birth, and education of self-described vegetarians, true vegetarians, and respondents who reported eating no meat. A cautionary note: We are dealing with quite small sample sizes for some of these (e.g. true vegetarians are only 108 out of 16,241 respondents). So, these population estimates are very rough. The gender effect is strong and consistent across vegetarians and non-meat eaters. Roughly two-thirds of “true” vegetarians are female, as are self-described vegetarians and people who didn’t eat meat on either survey day. True vegetarians are almost entirely non-Hispanic white or “other” race/ethnicity (91% of true vegetarians versus 72% of the overall population). 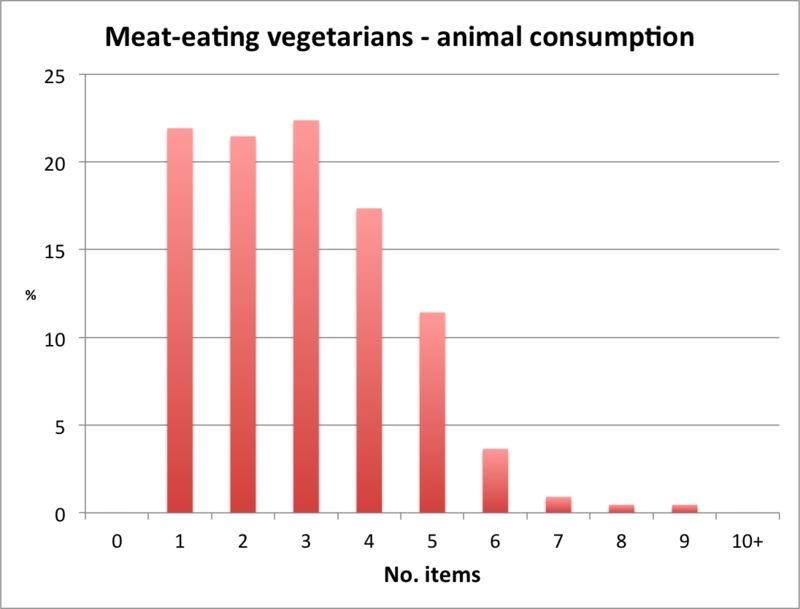 The group who reported no meat consumption is similarly skewed (84% versus 72%). 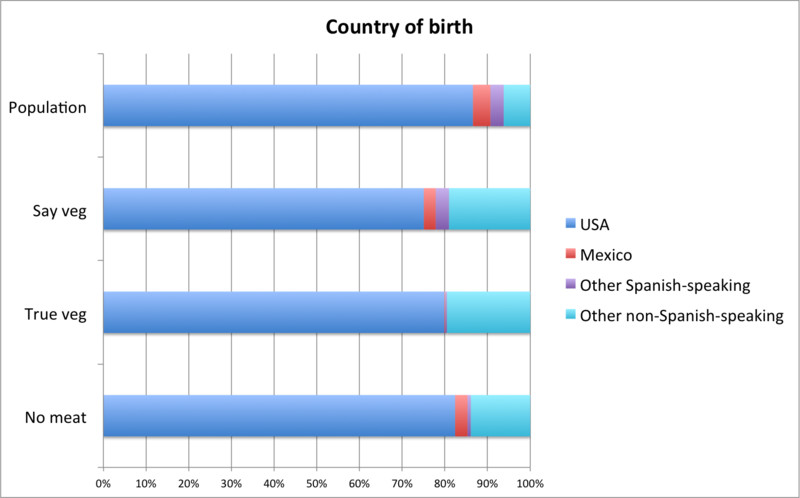 Very few people from Spanish-speaking countries report not eating meat and virtually no true vegetarians come from Spanish-speaking countries. I’d hypothesize that the large proportion of true vegetarians and non-meat eaters from non-Spanish speaking countries come from countries like India that have substantial vegetarian populations. Unfortunately, NHANES does not collect the data to test this hypothesis. 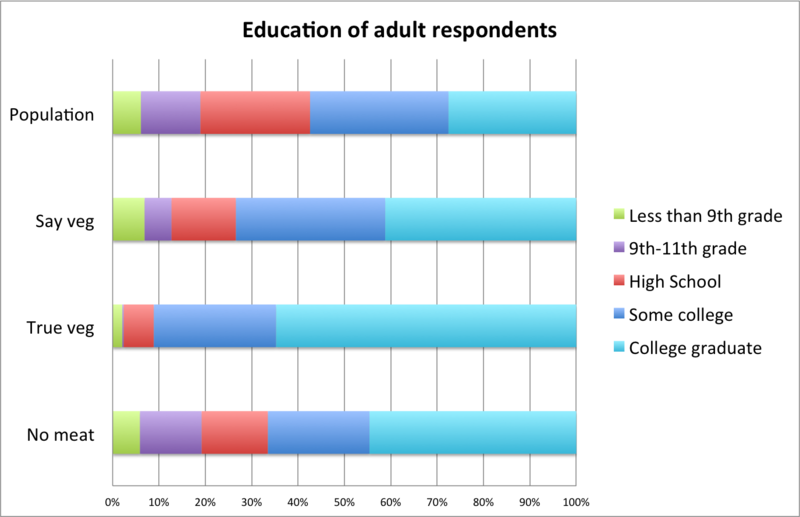 Among adults, true vegetarians almost all went to college. Not eating meat is more closely aligned with the education levels of the population as a whole, though it still skews educated. About half of all self-described “vegetarians” regularly eat meat or fish. There are very few pescetarians, so they can’t account for the many meat-eating “vegetarians”. A large proportion of people have days when they eat neither meat nor fish—an estimated 12.2% of the population ate veggie at least one of the two days for which they were asked to recall their diet. 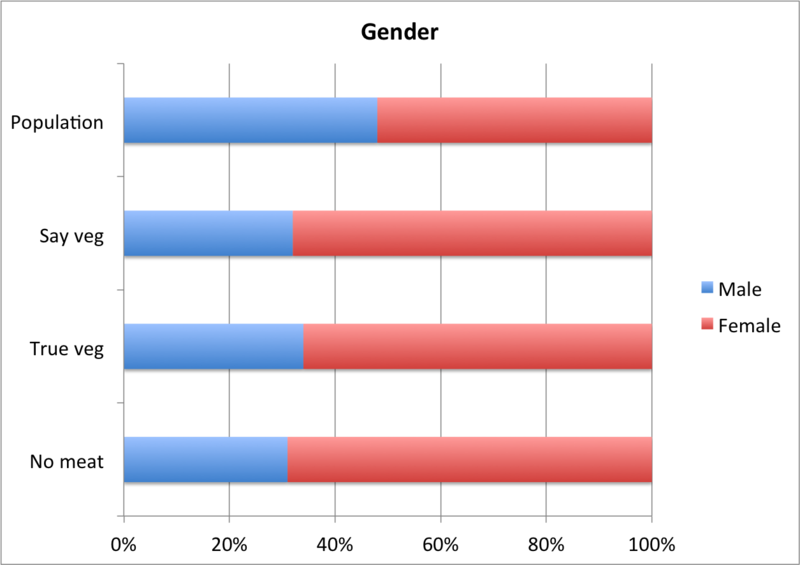 Many more women than men say they are vegetarians, are vegetarians, and have meat-free days. True vegetarians (those who don’t eat meat or fish) overwhelmingly come from educated households and are not Black or Hispanic. People born in Spanish-speaking countries very rarely have meat-free days. The NHANES surveys collect very high quality data from a representative sample of the US population. It implies that there are far fewer vegetarians than many other surveys would suggest. The finding that “true” vegetarians tend to come from educated households might partially explain why online surveys find a higher percentage of vegetarians—the respondents to such surveys are also likely to skew educated. If these low numbers are surprising, it may also indicate that animal welfare advocates tend to come from demographics where vegetarianism is more common. We should beware of living in a bubble where we think most other people are like us. Asking people whether they are “vegetarian” gets us limited information about what they actually eat. Someone who says they are vegetarian probably eats less meat than average and might not eat meat at all, but we can’t assume they have given up meat. This is why Faunalytics recommends anyone interested in conducting diet research use a Food Frequency Questionnaire (FFQ) rather than asking people to describe their diet. It is an open question whether persuading people to follow a vegetarian or vegan diet is the best strategy for animal welfare advocates. This data certainly suggests that becoming “vegetarian” may do less good than we thought, since many vegetarians continue to eat meat (even if in smaller amounts). Given the numbers of people who currently have vegetarian days, it might be more fruitful to emphasize meat-free days and meals as a way to reduce meat consumption. The full write-up of the analysis, Stata do-file, and USDA (WWEIA) food codes classified by meat and fish content are all available here, on Faunalytics’ page on the Open Science Framework. We encourage other researchers to make use of the food codes if they can. Joseph Millum is a philosopher and bioethicist living in Washington, D.C. He recently published a book on the ethics of parenting called The Moral Foundations of Parenthood.